Could this be an answer to our steno hardware problem? 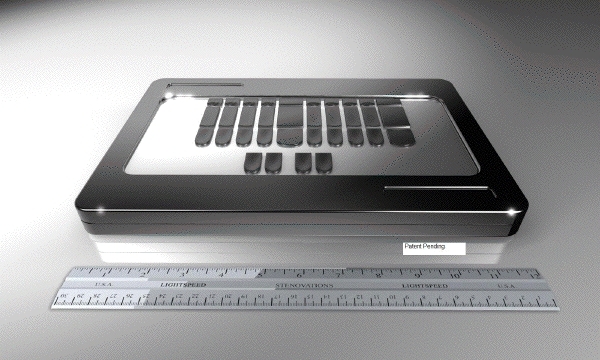 It talks about unlimited multitouch, up to 20 fingers or more. If you program in a steno keyboard layout and stick some keypads on there for ergonomic feedback, could that serve as a poor man's Lightspeed? The question is whether it'll actually be cheaper. Low-end drawing tablets have gotten quite reasonable in price; I saw one at Staples the other day that boasted multitouch (meaning up to three inputs at a time) and went for only $50. But this looks like a flagship model, and I know some of the top-of-the-line drawing tablets go for several thousand. Still, there's a lot bigger market out there for those than there currently is for steno machines, so if the price comes down in a year or two we might have our solution. Hi, Bigporch. The Stenovations Lightspeed is very popular. I know lots of people who own them and like them a lot. It's probably worth a call. I've noticed that internet ordering is broken on several steno machine companies' sites, even though I know for a fact they're still selling them. Good luck, and let me know how it goes! If I were to buy a non-ergonomic machine, it would probably be a LightSpeed, but I'm holding out for a homebrew version, once Plover gets off the ground. It might be the answer to our steno hardware problem. If they will be releasing this product in the market, I think people will dig this. Huh. Yeah, thank for the link, Ryan. That Capacitive switch film looks especially interesting. I wish I had more electronics knowledge; I'd love to cook up a wearable steno keypad out of that stuff. Well, I'm not a poor man, but I hate to pay thousands of dollars for a machine I know doesn't have the hardware cost of more than a hundred dollars. It is a captive market -- even if the consumer base jumped to double what it is today, the companies out there will still want to charge thousands of dollars. I haven't quite figured that out. There are a lot of good used machines from those who have given up on becoming court reporters. Still, I want a machine that is portable -- the Lightspeed is great -- they are only selling the court reporter model now -- they at first were selling the newest model without the bells and whistles -- now it is standard, and the price is about $3k. I specify that is not so bad -- but I don't need the bells and whistles -- I am proudly a certified CART provider [And certified court interpreter]. I really hope that the situation will be resolved with the Stenosaurus. I like the idea of not carrying a load full of equipment when I caption nightly at the university. Meanwhile, I will wait. I have tried the new Lightspeed, and it is a great machine. Still, I want to be one of the first customers of Stenosaurus, when it is available.